This is a long post, overdue, and I am happy to be finally writing it!! 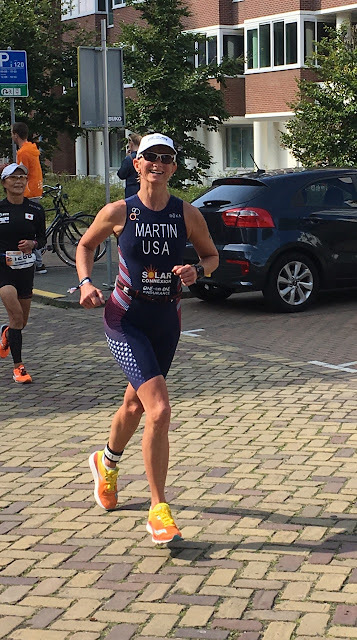 I've been home a week, but I returned with a pretty nasty cold, to a very full weekend of our athletes racing, plus all the normal unpacking and family catch-up to do. Then yesterday we welcomed two German exchange students who will be staying with us for the next two weeks. There hasn't exactly been a lot of down time!! Deep breath...where to start? How about the beginning! First off, racing internationally is a challenge just to manage the logistics, to pack, and to get around. About a week before the trip I took a closer look at my ticket (booked in January) to discover that it had been changed over the summer from a destination airport of Rotterdam to a destination airport of Amsterdam an hour away. That meant arranging for a taxi that could accommodate a large bike box. The trip involved driving to DC (250 miles), taking the hotel shuttle to the airport, flying to Munich, flying to Amsterdam, then taking a taxi to the hotel (which ended up being two hours with traffic). The trip was relatively smooth though and the bike arrived safely (yay! ), which is not always the case. I know of at least one Team USA member who never got his bike. 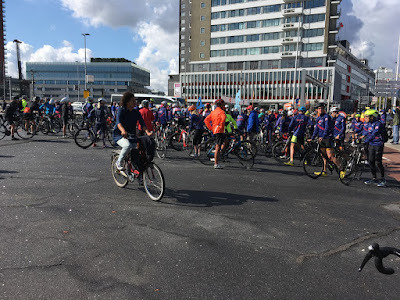 I got in late Thursday for the Sunday race and was bummed that it wouldn't be in time for the Parade of Nations and team photo, but there were such terrible rainstorms that the parade was cancelled. The practice swim had been held earlier in the day, which I would also unfortunately miss, but I later learned it was pretty traumatizing for some in the driving rain. I sure hoped the weather would improve from the mid-50s and rain that greeted us on arrival! 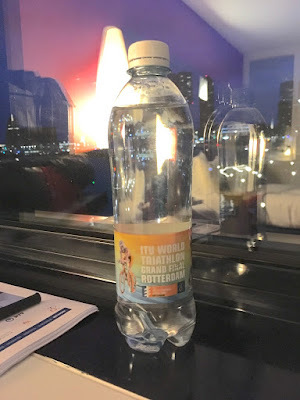 I stayed at the Team USA hotel (Inntel Hotel) which was really nice and about as convenient as it could possibly be. I was on the floor with the Water Spa - warm pool, sauna, Turkish steambath, soothing music - which was really nice. 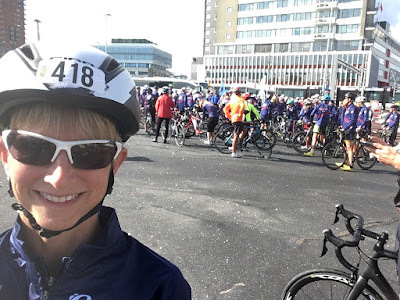 I had booked it independently, very early, and before we knew it was the team hotel. 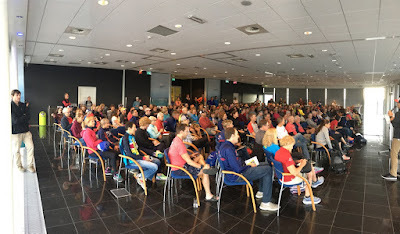 Being in the team hotel means the team meetings, bike mechanic, coach, chiropractor, massage therapist, doctor, and team managers were all right there along with the communication board in the lobby. It makes it a little nicer and fun to share space with teammates! 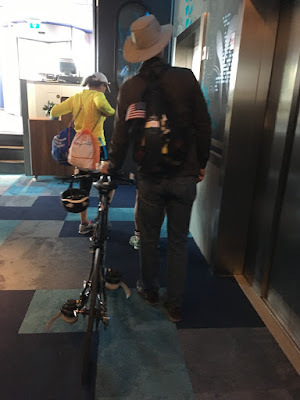 The restaurant was full of people in Team USA gear as well as Team GB as a number of them were in the hotel too. 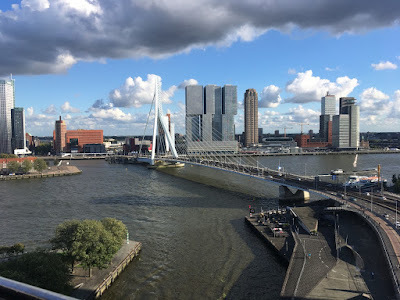 I had a corner panoramic room with full windows on two sides and a view of the bike turnaround, the Erasmus bridge, and of the busy intersection with pedestrians, the electric tram, tons of bikes, scooters, cars (most of them little), and boats in the water! It was endlessly fascinating to watch! 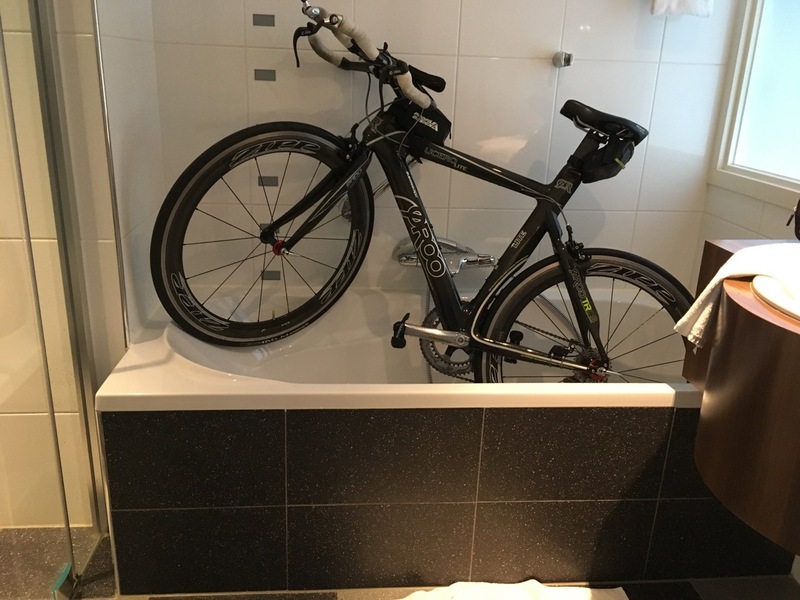 When in a small European hotel room you get creative with bike storage. 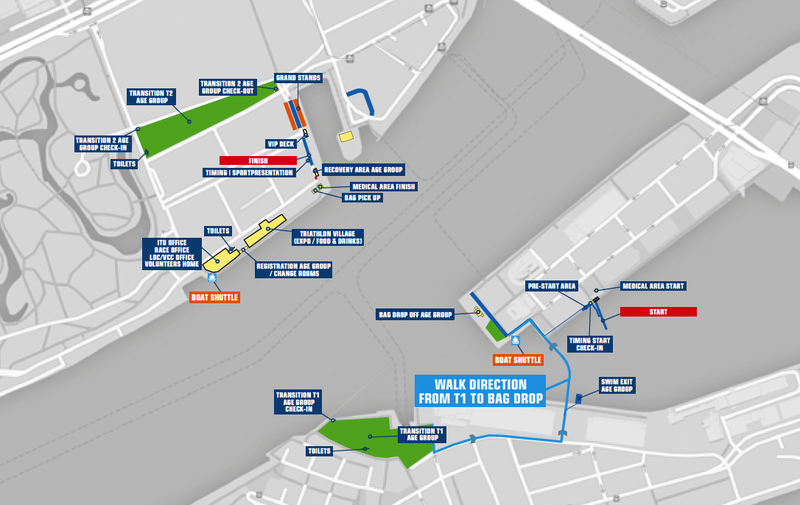 I went to get my race packet and check out the general area of T2. 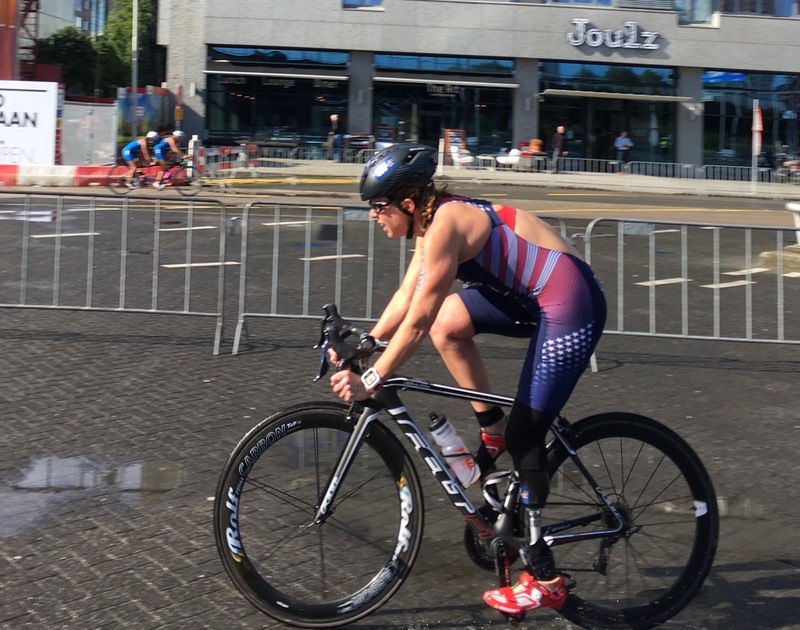 The paratriathlon races were underway and as I was walking by I got to see (and yell for) Patty Collins on the bike! 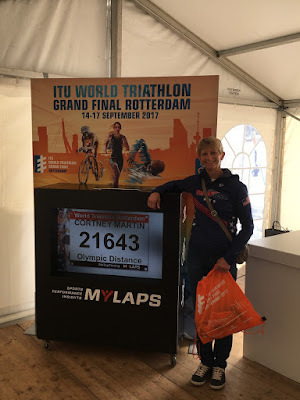 I was disappointed I could not watch more of their races as I knew quite a few of the athletes (and coaches) but the day was packed for me. Top US Paratriathlete, Paralympian, and Coach Patty Collins! 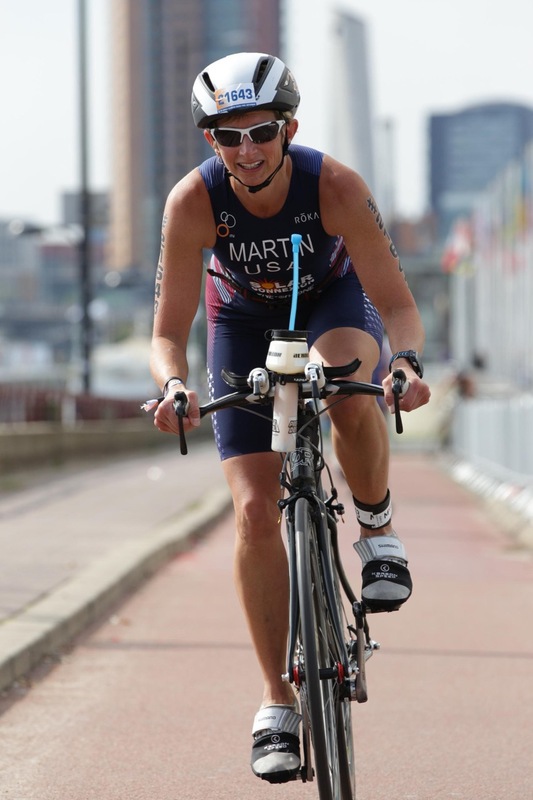 One unusual thing about this race was there was NO race t-shirt! You could buy a shirt, but I didn't care for the rather boring technical tee they had. I was talked into getting *something* which ended up being a bike jersey and matching arm warmers, which I have already worn and love! 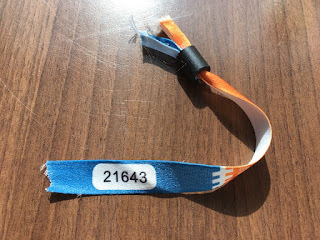 One nice thing was that rather than those stiff plastic race wristbands, we got a nice soft cloth-like one. 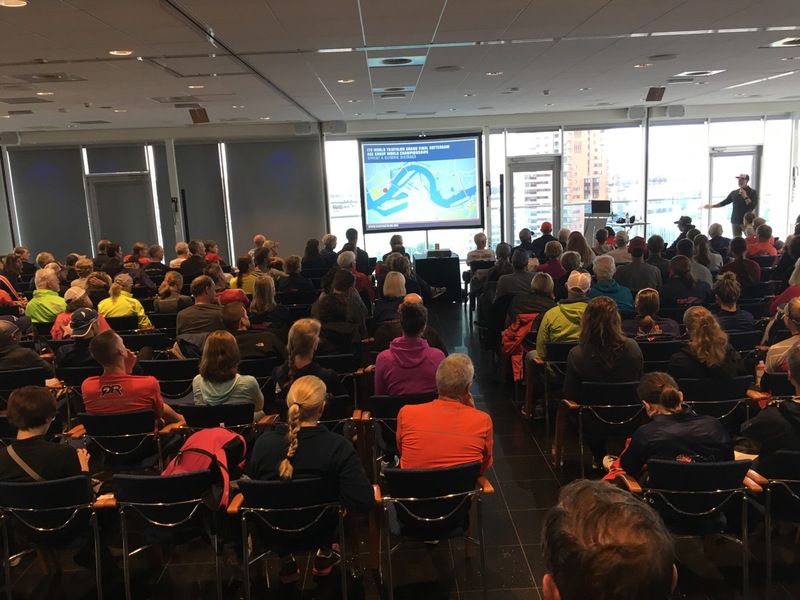 We had a very large group turn out to ride a loop of the course with the team Coach Thad Beaty and Tim Yount, most of us decked out in our Team USA jackets. It must have looked like quite the parade as pedestrians stopped and took photos. As could be expected with a large group of triathletes, and more than a few with questionable bike handling skills and distracted minds, there were a number of low-speed tipovers. 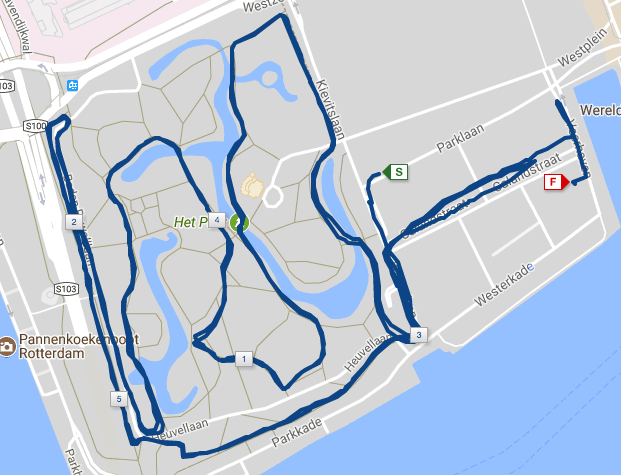 I felt a little better after riding the course; at least I knew what I was in for. Friday evening we had a Team USA social on the top floor of our hotel. It was a spectacular view and nice to catch up with old friends and meet new ones! This is when we get our official Team USA pin. Our hotel showing the cantilevered room and balcony at the top. Thankfully I had adjusted pretty well to the 6 hour time change and got some good sleep. 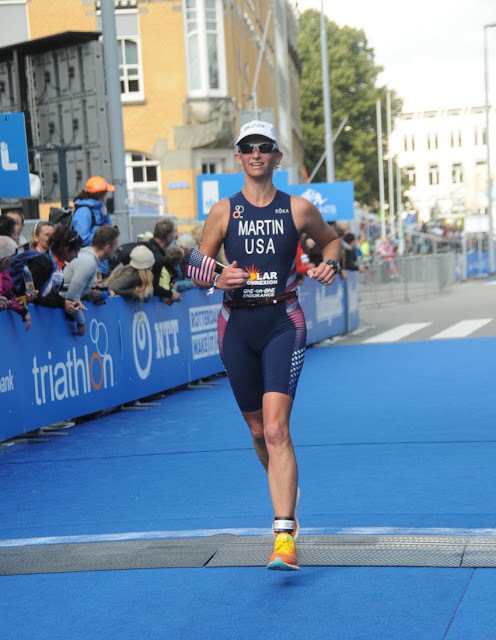 The highlight of Saturday was the pro races -- the World Championship race for the elites! I needed to get a bit of a run in to loosen up the legs so I decided to run to the swim start that was about a mile away and check it out. 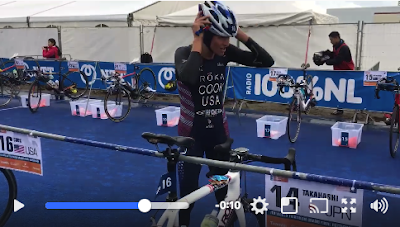 I ended up sticking around to watch the start of the men's race and positioned myself as THE closest person to American Eric Lagerstrom's bike and watched/videoed his transition from just the other side of his rear wheel! The pro transition area was by swim start; ours was across the water. You can see how close we could get! What other pro sports offer such access to fans? I decided I wanted to do the same for pro Summer Cook's race later in the day. She is an athlete I have worked with for a few years now (marketing, social media, etc). My plan was to take my bike with me, watch her swim finish, get my bike checked into T1, then head back across the water to watch them run (it's a two-transition area race). Here is Summer's speedy transition. She kept her neoprene cap on under her bike helmet for extra warmth. Summer's T1. She had extra layers for the cold day! 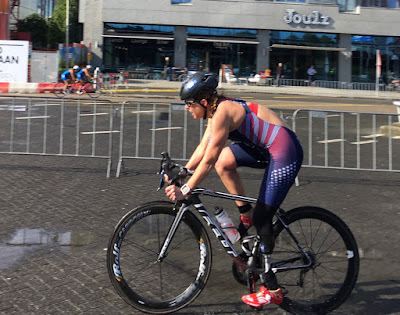 After Summer took off on the bike, I headed to T1 and waited in line (there is a lot of time spent in lines at races) for a brief equipment check, racked my bike, and took a water taxi where I caught most of the elite women's run. 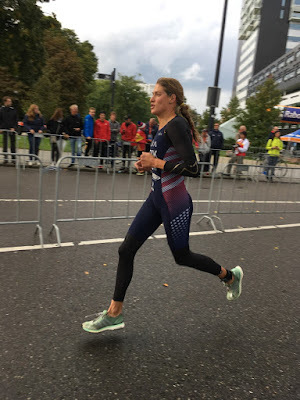 It was such a treat to watch Summer and the other top ITU women race!! Summer finished 9th, and in 10th overall for the World Triathlon Series for 2017! My favorite picture I took of Summer. Then it was back to the hotel to eat and finish getting organized for my race the next day which included putting a number tattoo on my wetsuit which was a first. On Sunday the age-group race started at 7:30 am but my swim wave would not go off until 11:15 am. I was to check in my running gear at T2 between 8 and 10 am, then take a water taxi to set up my bike gear/nutrition between 8:30 and 10. 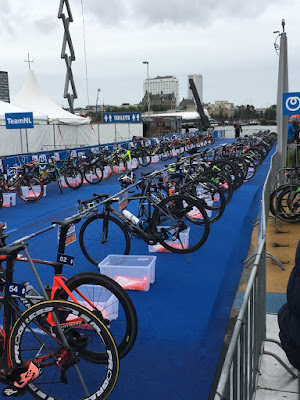 It's strange setting up your bike area in a "live" transition area but it seemed to work, and I was thankful that it made for a more leisurely morning timetable for those of us who raced later. 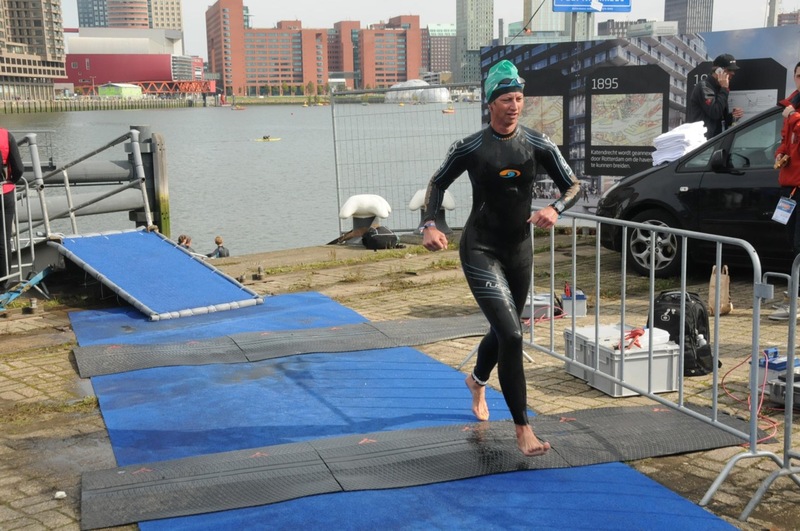 Swim start, T1 and T2 are all in different places with water in between! The day was sunny and mild -- absolutely perfect race conditions!! But waiting to start is rough!! The swim looked long...and was long with reports of 1700m. Not that it mattered. Finally, it was time for the F50-54 crew to hit the water. We jumped in the brisk water, each with a hand on the pontoon, and we were off. I did not have a good start. I meant to find a foothold to push off the pontoon and get to the front of those around me but the gun went off so fast. Instead, I started off behind a dense little pack, but soon enough found a way around. It was nice to just get to work and it didn't take long for that cold water to feel really good. 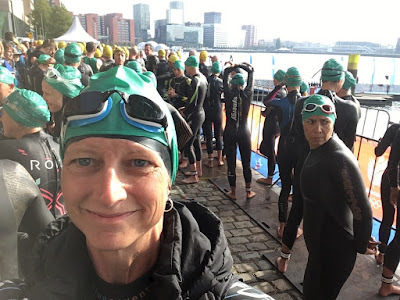 I ended up swimming in close proximity to a group of other women, catching drafts and making my way through the pack as I could. 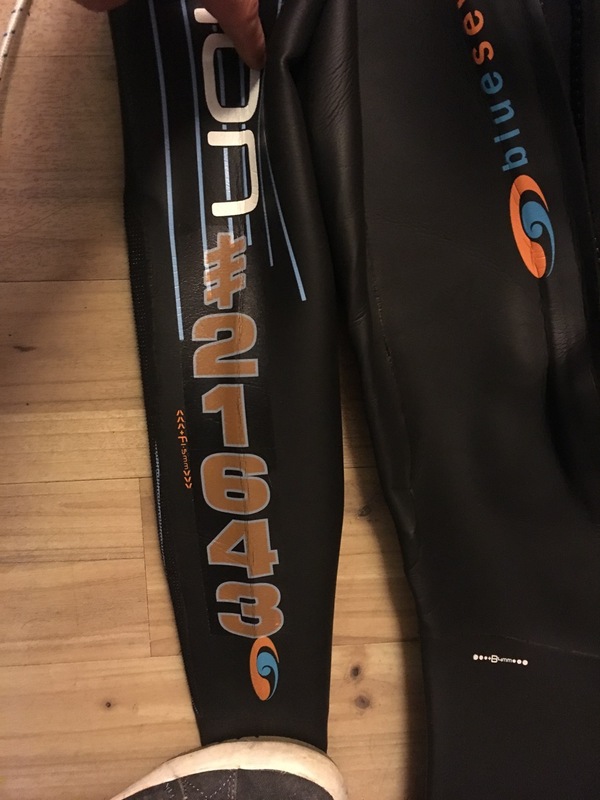 Out of 77 starters in my group, my swim was ranked #32, finishing in 0:27:56. Swimming remains my main weakness!! swim start is half-way up the left of the photo, swim exit at the right. 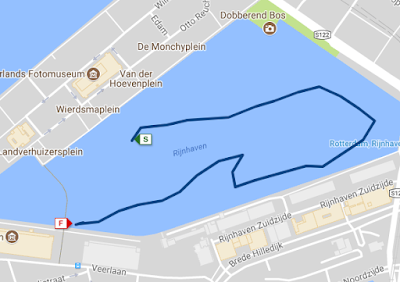 the little indention was part of the course, not just me swimming crooked! In T2 I had an issue finding my shoes and spot on the rack and I went to the wrong side. The lesson is I should have taken more time in the morning to get my bearings. My T2 rank was a dismal #44...ugh. I headed out determined to have a mentally strong happy run, which I basically did. (44:50, rank #22). About two miles in a cramp began brewing on my inner left thigh. It's an unusual spot for a cramp but it's where I get them now, and I wonder sometimes if it has anything to do with where my saphenous vein was harvested or is some byproduct of my iliac artery patch, but whatever...it just is. I'm just happy I *can* run after that. Unfortunately the cramp stopped me cold at about 4 miles in. Fortunately, it cycled through and resolved relatively quickly and I was able to finish without further trouble. Mile splits: 7:32, 7:52, 7:32, 7:50 (cramp coming on), 8:30 (cramp), 7:38. 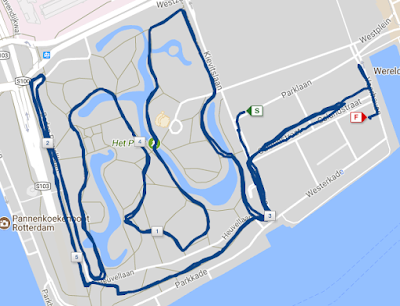 The route was two loops back and forth through a park - kind of unusual - but I liked it well enough [Garmin data]! I'm proud to have finished in the top 25%. And I did so as a single working mom, with limited training time, and an extremely full life with my two boys! 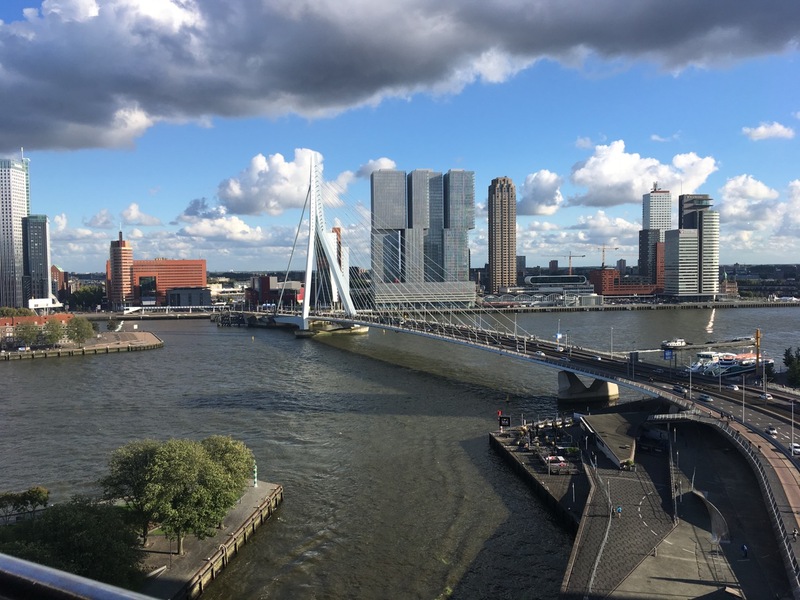 Rotterdam was an excellent host for the Grand Final. They had an enormous number of staff, volunteers, and marshals that pulled of a packed three-day race extravaganza with multiple courses. It felt like a proper Grand Final!! The signage, the vibe, the race venue -- all very top-notch. 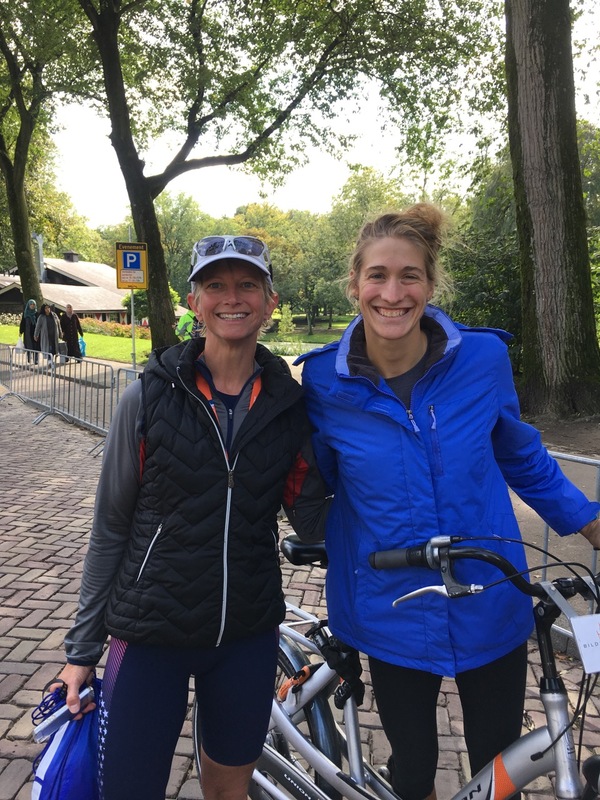 Following my race, after I'd collected the bike and was walking back to the hotel, Summer spotted me and I chatted with her and with her parents for a while. I doubt anyone guessed that the unassuming tourist pedaling the hotel commuter bike had just finished 9th in the world the day before!! 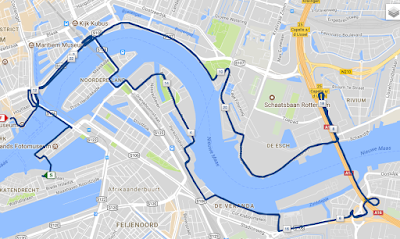 Following the Olympic distance race was the age group Sprint (draft-legal) race. 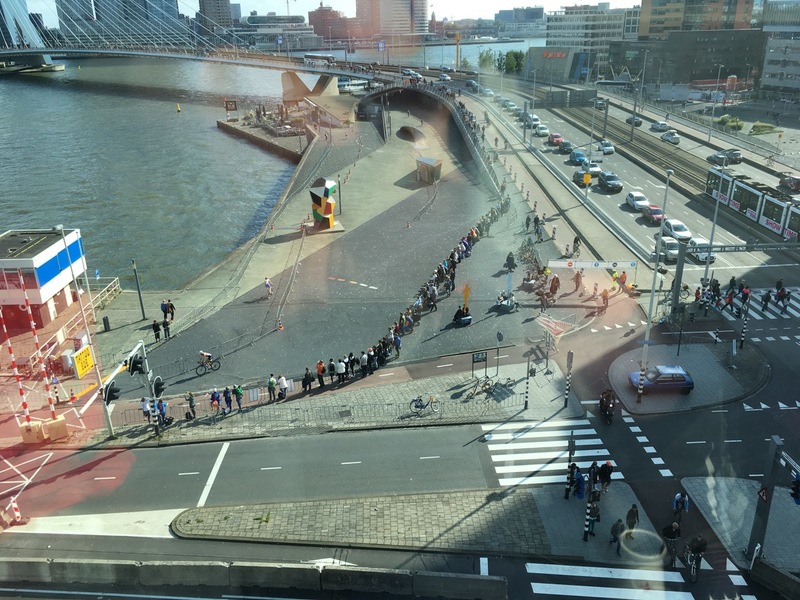 I caught some of the bike action from the hotel window. On Monday, I slept in! 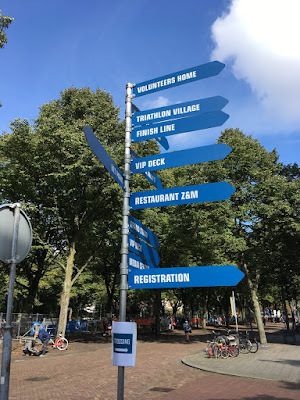 Then we went back to the park for lunch (De Ballentent) and to the Euromast to take in the 360 degree view of Rotterdam. After that, it was a harbor tour with Spido, which showed how busy this inland port city really is with container ships, container yards, and cranes everywhere! Near the park we watched the race venue slowly being disassembled and spotted a large pile of race posters lying on the sidewalk that had been there all day. We asked about them and well...this is perhaps my favorite race souvenir ever!! 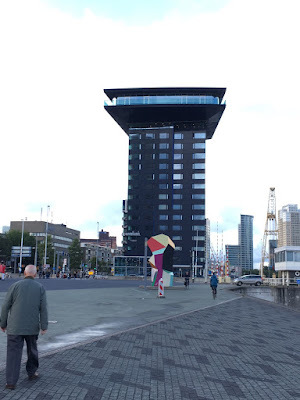 Tuesday was the last full day in Rotterdam. We rode hotel bikes to the zoo, along the incredible network of bike paths in the city! 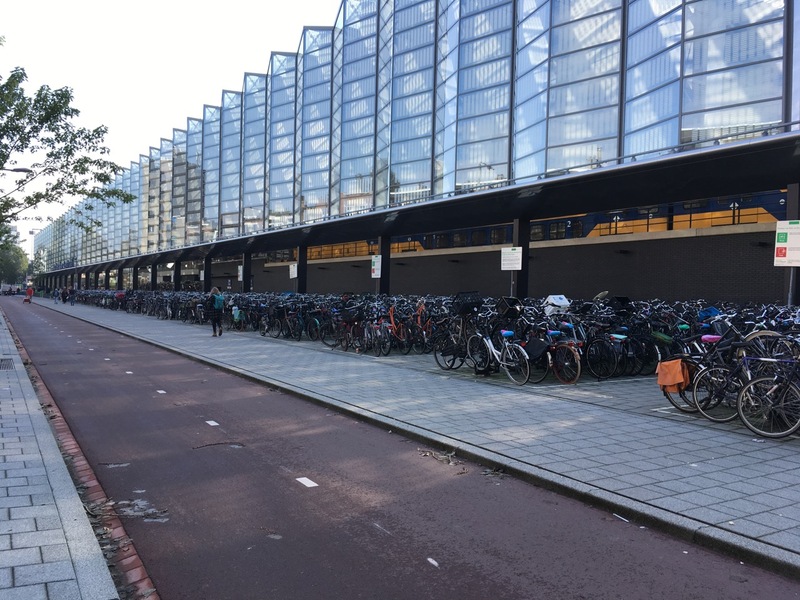 It took us past Central Station (train) where I saw a jaw-dropping number of bikes parked. So, so many bikes everywhere. I could not get over the bike path system, complete with scaled down traffic lights. It made me think back to childhood when we would draw road systems on the driveway in chalk and ride our bikes through them, wishing it was the larger world! This is what every city should be. Everyone rides bikes - no matter the weather. The zoo was fantastic! 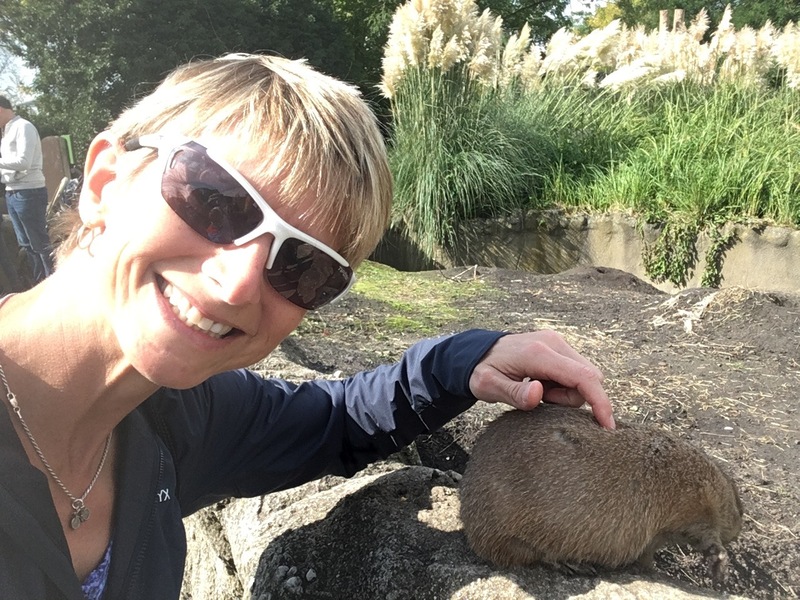 You could get much closer to the animals and interact in ways you would not experience in the US. 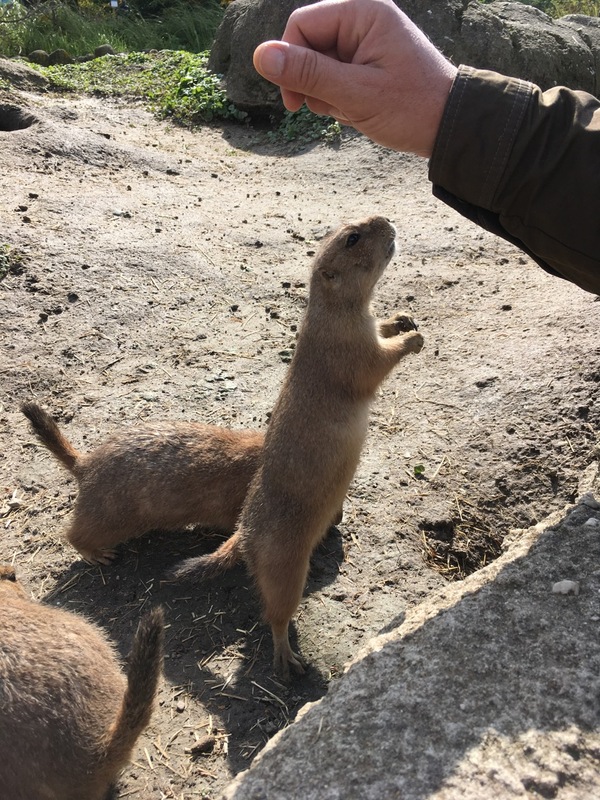 Two of my favorite exhibits were the prairie dogs and the giraffes. We walked right into the prairie dog area and played with them!! (There was an electrified cattle guard type gate that kept them contained but allowed us to walk in and out. We did notice one 'escapee' just outside.) In the giraffe area, we stood in an elevated area, at the level of their heads, and they could come right up to us, close enough to easily touch. panorama -- that ledge is straight across, and the giraffes would put their heads over the ledge and it was open to us -- no glass! The Netherlands clearly relies on the ability of people to behave and not do stupid things much more so than here in the US. Plenty of the bike paths along the water had no guard rails. We saw very few police; they didn't seem so necessary! I truly fell in love with the city. (Oh...and pretty much everyone speaks English and every restaurant offered a menu in English.) I enjoyed the bountiful salmon, cheese, and bread. That marks the end of my report! HUGE huge thanks go to the best-ever sherpa, the champion sherpa among sherpas, Bryan, and Solar Connexion, who makes my racing possible. I could not do this without him. Thank you to Coach Jim of One on One Endurance for preparing me to race my best in ways that work with my life and make it fun, year, after year.